"Sometimes, things find you when you need them to find you, I believe that. And for me its usually song lyrics." Wednesday is undeniably the most boring day of the weak. I call it the "hump" day because it's right smack in the middle -- the weekend seems so far away and it always feels like there are a LOT more stuff to do. Don't you get that feeling? Wednesdays are always hard to get by. So, I decided, why not do something to look forward to every Wednesday? 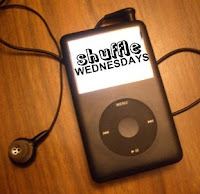 Enter Shuffle Wednesdays. Because my favorite thing to do on my iPod (next to organizing my playlists) is playing Shuffle on it, why not share it with all you guys? I will come up with several random songs using the Shuffle mode and put them here for your auditory pleasure. It feels like a big deal to me actually because I've always been possessive about the songs and bands I know and love. I have an unexplained aversion towards mainstream, and so I prefer my favorite music to remain under the radar. But it's about time I grow up and learn to share them with you guys. After all, you deserve something more from this blog other than just my rantings after all these years. On to the music. I'll give you a full batch of ten for the first one. Download them, listen to them, share them, do whatever you please. Press Play! "I'm writing you to / catch you up on places I've been / and you have this letter / you probably got excited / but there's nothing else inside it / didn't have a camera by my side this time / hoping I would see the world through both my eyes / maybe I will tell you all about it /when I'm in the mood to lose my way with words"
- As I have always said, John Mayer is poetry with an acoustic guitar. He never fails with his songs. Never. I just downloaded his entire discography (that's 2GB worth of album tracks and live performances) and may I just say, it was sooo worth it. So don't be surprised when he always pops up in the Shuffle. Also: Thank God his concert was moved to October 1st! "Don't worry / I'll catch you / Don't worry / I'll catch you / Don't ever worry / No need for reminding / You're still all that matters to me"
- This song have always meant a lot to me, especially in my junior year of high school when I first heard it. It's a song that starts out gentle and slow, that some may consider to be bordering on emo but is still to me one of the simplest but most beautiful songs ever written. It was played in Episode 3x15 of One Tree Hill. "You know it will always just be me / Let's get these teen hearts beating faster / Faster / So testosterone boys / and harlequin girls / will you dance to this beat / and hold a lover close"
- Who doesn't know of this song? It will always be my "Valentine's Day" theme song. The acoustic version is much more awesome though. Brendon Urie's bedroom voice = WHOA. "Remember how it used to be? / ...It was the sweetness of your skin / it was the hope of all we might have been / that fills me with the hope to wish impossible things." - One of my favorites from this band. It sings of longing and regret. Very haunting, and gives you the kind of nostalgia that is almost painful to listen to as it is to feel. "Akin ka na lang / iingatan ko ang puso mo / akin ka na lang / at wala nang hihigit pa sa'yo." - Cheery pop rock happiness is always served best by Itchyworms. I love this version better than the original. It's every wishful/desperate admirer's song. "So take a look at me now / since I told you it's over / you got a hole in your heart / I'll find a four leaf clover / you can't tell me this now / this far down the line / that you're never, ever gonna get over me." - This can be a good accompanying song/response to "To Wish Impossible Things" since on the other hand this sings of disbelief that his ex still cannot get over him. "I'm selfish / as selfish comes / you're giving me a run for my money / honey." - It's such a shame that this band broke up already because I loved them a lot. I discovered them in my junior year also, and a number of their songs possess that rare quality of being catchy yet very meaningful. "Satellite in my eyes / like a diamond in the sky / how I wonder / satellite from the moon / and the world your balloon." - Dave Matthews Band. Enough saaaaid. "We're going down / and you can see it too / We're going down / and you know that we're doomed / my dear / we're slow dancing in a burning room." - One of the most aching and truthful songs ever written. The first time I heard this in my dorm room during freshman year of college, I cried. I swear I did. It's such a painful admission of a doomed relationship -- there's no way out, it's a dead end. If this doesn't get to you, you're made of stone. "Non amarmi perche' vivo all'ombra / non amarmi per cambiare il mondo / tanto il mondo non si cambia / e siamo tutti specchi / fatti per guardarsi /e diventare soli e vecchi." Translation: "Don't love me because I live in the shadow / don't love me to change the world / because anyway the world won't change / and we are all mirrors / made to be looked at / and become lonely and old." - We discussed this song in my Italian11 class, and I ended up loving the song. The speaker is telling his lover to not love him because of his imperfections and his inadequacy to give her the love she deserves. Italians are known romantics and when translated to English, this will undeniably fall under the "super cheesy" category. But I don't know, I fell in love with this song. After this, I started downloading Italian songs for my own listening pleasure and for educational purposes as well.